1922-D No D is a Top Performer in Lincoln Cent Series. All Lincoln Cents minted in 1922 came from the Denver Mint, but a few of them are "Plain", that is, they're missing the "D" mintmark. Most researchers believe the 1922-D "No D" cent occurred as a result of repairing damage caused by die clashing. (clashing occurs when the obverse and reverse dies strike each other during the normal striking action, but without the coin blank in between, resulting in possible damage to the dies). In the process of removing the clashmarks, the “D” was obliterated, which caused the location on the coin to be blank where the mintmark should have been stamped. Since that time, the 1922-D "No D" cent has been not only a favorite of Lincoln Cent fans, but a desirable acquisition for rare coin collectors of all stripes. The "strong" reverse classification is the preferred variety. Ironically, had cents been produced at the Philadelphia Mint in 1922, the "No D" rarity would probably have never been recognized. Upon hitting circulation, Denver cents missing the D would have been assumed to have originated in Philly. Be careful when buying a 1922-D "No D". As should surprise no one, many so called "no D" cents have been passed on to unsuspecting collectors that are actually lower valued 1922-D cents altered to remove the D. That's why it's better to obtain examples of this rarity certified by PCGS, NGC, ICG, or ANACS. Altered coins very seldom slip past the experts. 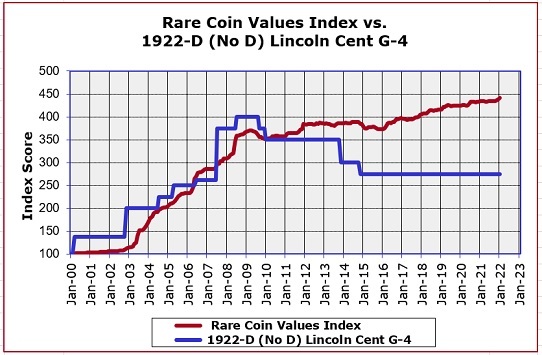 The blue line above shows the percent gain increase of the 1922-D (No D) strong reverse Lincoln Cent in G-4 condition. The red line depicts the score of the Rare Coin Values Index, which charts the composite percent performance of 87 rare and popular US coins. The 1922-D "goof" coin closely mirrors the Index score, mostly on the high side of the trend. The Index is updated monthly.